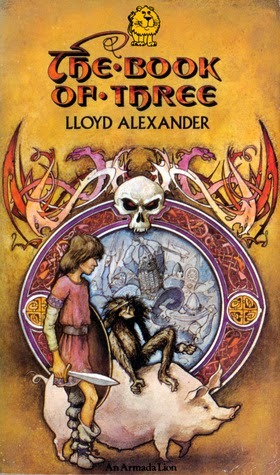 Lloyd Alexander's Prydain series is the latest in the list of books I'm reading to my boys. I vividly remember reading and loving these books when I was Will's age. (We're reading from my childhood copy which is literally falling out of its cover.) Since I can't go back and read them for the first time, I enjoy re-living the discoveries through their reactions. It's been slow going, however. With tae kwon do, scouts, wrestling, youth group, and other random commitments, it's been harder to find time to read together this spring, so it took a good two months to get through The Book of Three. We frequently had to skim the last chapter or two to remember where we were in the story, but it was worth it. I'll admit I found Alexander's writing a bit more stilted and forced than I remembered it and I was surprised by just how gruesome some of the descriptions and scenes are. For example, the Horned King wears a human skull as a mask (how exactly does that work, logistically, though?) and burns men alive in large wicker baskets as their screams fill the air. When I asked what their favorite parts were, my boys both exclaimed "Spiral Castle!" I don't blame them one bit as so many pieces of the story have their inception there. Captured by the evil sorceress Achren, Gwydion and Taran are separated, new friends Eilonwy and Fflewddur Fflam are introduced, a daring escape leads to the destruction of the castle and the consequences of that destruction dictate the direction they must travel to fulfill their quests. I appreciate that Alexander shows Taran's growth along the journey in how he makes decisions, in his interactions with others, and in his introspective judgment of himself. It's led to some interesting discussion with my sons. We've already started on The Black Cauldron and I'm looking forward to seeing it anew through my boys' eyes.